Jim Mallinder heaped praise on ‘remarkable’ Samu Manoa after the big American made light of illness to help Saints slay Harlequins at Twickenham. 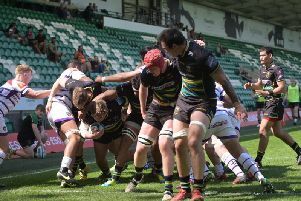 Manoa had been suffering with a virus in the build-up to Big Game 7, but he was at his bulldozing best in the superb 30-25 success on Saturday evening. He scored one try and superbly set up another for George North as Saints stayed top of the Aviva Premiership with a gritty success. And Mallinder was quick to hail his heroic No.8, who is determined to end his time at Northampton on a high ahead of a summer move to Top 14 giants Toulon. “He’s actually been poorly for the past 24 hours and been in bed with a virus, so it was a remarkable performance from him,” said the Saints boss. Saints had little possession but plenty of menace during their victory at Twickenham, where they claimed the Premiership title back in May. And although Mallinder wasn’t delighted with the nature of the win, which was earned in spirited fashion, he was happy to see his side claim another vital four points. “I don’t think we’re overimpressed with our performance today,” he said.